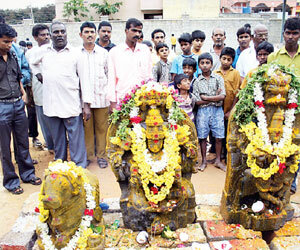 BANGALORE: Workers of the Bangalore Water Supply and Sewerage Board (BWSSB) accidentally stumbled upon three ancient stone idols, believed to be at least 400 years old, while laying new pipelines near the Kote Anjaneya temple in KR Puram police station limits. It is claimed that the idols belong to an old rundown temple situated near the Venkateshwara Temple of the Vijayanagar dynasty. Immediately after noticing the idols, the BWSSB workers told the residents of their discovery, who then informed the tahsildar. The residents consider the discovery to be auspicious as a new temple is under construction just a few metres from the place were the idols have been unearthed. The ancient stone idols were of the gods Krishna and Nandi, and goddess Annapurneshwari.